We don’t often think of damage from frozen and broken water pipes as being on the same scale as a natural disaster, but damage from water is the most prevalent — yet least recognized — catastrophe. In fact, frozen and broken water pipes rank No. 2 behind hurricanes in terms of both the number of homes damaged and the amount of claim costs in the U.S. Homeowners can take a few precautions to ensure their pipes don’t freeze during the cold winter months. If leaving for vacation, turn your main water line source off. The main water line is typically located in the basement and connects your homes water lines to the city’s water line. In the event of a broken water pipe, your safe because the water is turned off. Or, if your leave for an extended period of time, try leaving the thermostat above 60 degrees. Also, it is a good idea to have a family member or friend to check in on the home every few days. Make sure all pipes that face an exterior wall (outside wall) are properly insulated. Strong winter winds can blow inside walls creating ideal freezing conditions. 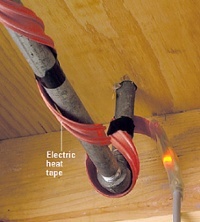 Try insulating problem pipes with electrical heat tape. These can be found at your local hardware store. Leave your water running from your faucets. Let your water slowly drip out of the faucet, SLOWLY. This helps keep water moving, preventing it from freezing in your pipes. Turn the heat on in the home to help circulate warm air around the pipes. 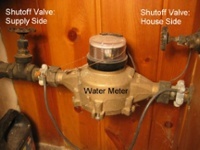 Turn the faucets on all the way to help relieve any pressure in the water pipe. You can use electrical heat tape mentioned above. Use a space heater near the frozen pipes. Be sure to keep it safe from causing a fire. Keep the heater away from any flamable material. The best and safest way, is to call a local plumber who can help you take care of the frozen pipe. A professional will know of the safest and most effective ways to thaw out a frozen water pipe. So the home gets soaked with water out of the water pipes! This can be a nightmare! This isn’t exactly drinking water, but it’s pretty clean – you figure. So the owners were gone for the weekend! The basement quickly turns into a lake. Yea, the wet carpets smell, but heck … they can be dried out just by opening the windows for a day or so – you figure. use dehumidifiers to help reduce the amount of moisure in the area. This will help pull moisture out of the wet contents. 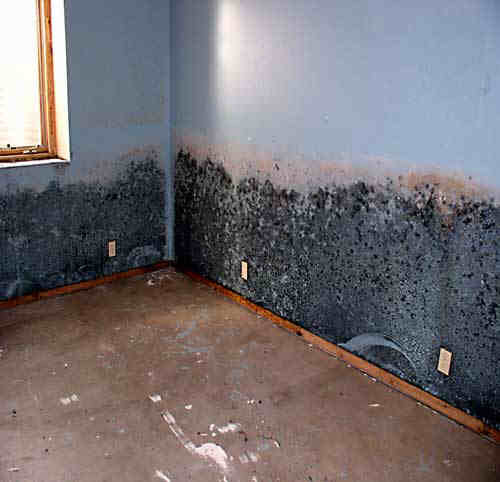 Water contamination spreads to unaffected areas; stains released from furniture (especially antique) discolor carpet permanently; moisture-sensitive surfaces on furniture turn white; paper goods are ruined due to moisture absorption and swelling’ paper goods are ruined due to moisture absorption and swelling’ pre-existing (animal) odor becomes apparent. Furniture in direct contact with water delaminates, swells, legs begin to split, drawers bind; Sheetrock swells and disintegrates; wall paper adhesives release’ bacterial odor (souring) becomes apparent. Mildew appears (hyphae), along with characteristic “musty” odor; moisture-sensitive internal components in pianos and organs begin to swell in the presence of condensed moisture; metal surfaces begin to rust’ door and window casings swell and distort or delaminate. Mildew associated with prolonged dampness sinks roots (mycelium) into organic materials (jute backings, paper coverings on Sheetrock, paneling, wood, etc. ); wholesale damage to structure and contents is experienced. Clean USA has all of these factors in place. 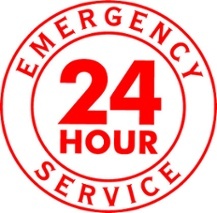 We are a 24-hour, 7-day a week company, and we are centrally located. We have ongoing training for our staff and we have a “911 Mentality” when it comes to responding to needs for service, especially in emergencies. Our policy is to try to save as many of the contents of the home or building as possible, and to keep costs down whenever possible. When you hire a quality company, you get quality work, saving money for all concerned.